With advances in gastric cancer chemotherapy, conversion surgery has drawn attention as a new strategy to improve the outcome of stage IV disease. We investigated the efficacy of conversion surgery following chemotherapy for patients with stage IV gastric cancer. We retrospectively reviewed clinico-pathologic variables and oncologic outcomes for 101 patients with stage IV gastric cancer who were treated with systemic chemotherapy followed by gastrectomy with intension of curative resection from January 2005 to December 2012. In terms of the best response from palliative chemotherapy, complete or partial response were observed in 65 patients (64.4%) in overall. Complete response of metastatic site were observed in 72 (71.3%) and 66 (65.3%) patients as best and pre-operative response, respectively. The overall complete macroscopic resection, rate was 56.4%. Eleven patients (10.9%) received combined metastasectomy. There was no postoperative surgery-related mortality for 1 month. The median overall survival time was 26.0 months. Multivariable analysis identified complete macroscopic resection, chemotherapy response (complete response/partial response) of metastatic sites, and change in CEA level as independent prognostic factors contributing to overall survival. Patients with stage IV gastric cancer who exhibit a good clinical response to chemotherapy might obtain greater survival benefit from gastrectomy following chemotherapy compared with patients who exhibit a poor response to chemotherapy. Prospective, randomized trials are required to determine the best strategy for combining initial chemotherapy with subsequent gastrectomy. Despite a declining incidence in many developed countries, gastric cancer remains the second most common cause of cancer-related deaths in the world [1, 2]. Although the prognosis of metastatic gastric cancer is poor, combination chemotherapy improved the quality of life and overall survival (OS) compared with the best supportive care in several randomized studies [3, 4]. In general, 5-fluorouracil (5-FU)-based or cisplatin-based combination regimens are widely accepted as potential standard therapies with a response rate of around 30–40% and median OS of 9–11 months [5, 6]. More recently, even greater progress has been achieved by combining conventional chemotherapy with a targeted monoclonal antibody (median OS, 13.8 months) . Although a large proportion of patients with metastatic or recurrent gastric cancer respond initially to chemotherapy, the disease ultimately progresses. In addition, a substantial proportion of patients have primary refractory diseases. Therefore, novel therapeutic strategies for treating metastatic gastric cancer are required. Currently, surgery is not a standard treatment option for patients with gastric cancer with distant metastasis, except for those who need palliative surgery for bleeding, obstruction, or perforation caused by the tumor. Recently, a randomized, controlled trial of reduction surgery plus chemotherapy versus chemotherapy alone for M1 gastric cancer (REGATTA trial) failed to show any efficacy of surgery . Recent advances in chemotherapy for gastric cancer have raised new clinical questions regarding the role of surgical intervention for patients with a good chemotherapy response, even if the patients have distant metastasis. Surgery for those patients might provide long-term survival benefit by removing macroscopic lesions remaining after chemotherapy. That type of surgery, referred to as conversion surgery, aims to cure the disease, rather than just provide palliative treatment, on the basis of the response to chemotherapy, as is done for initially unresectable colorectal cancer . However, the clinical value of such multimodal therapy combining chemotherapy and conversion surgery for stage IV gastric cancer remains controversial. The aim of this study was to evaluate the efficacy and feasibility of surgery in patients with stage IV gastric cancer who were treated by gastrectomy following chemotherapy, with a particular focus on the selection of patients who might benefit from conversion surgery. We retrospectively identified patients with a clinical diagnosis of stage IV gastric cancer who underwent gastrectomy following chemotherapy in Yonsei Cancer Center from January 2005 through December 2012. The key eligibility criteria were: (i) patients with histologically proven gastric cancer, (ii) who received systemic chemotherapy at the time of diagnosis of stage IV disease according to the AJCC 7th staging system, and (iii) underwent subsequent gastrectomy with the intention of curative resection. Consecutive patients corresponding to those criteria were included. We initially identified 106 patients who underwent gastrectomy following chemotherapy. Four patients were excluded because the aim of surgery was palliative (two patients underwent gastrectomy because of bleeding, and two patients did so because of gastric obstruction). One additional patient who received initial chemotherapy at another institution was excluded from the analysis, because there were no available clinical data from the time of diagnosis. Thus, we analyzed 101 patients (Additional file 1: Figure S1). This study was approved by the Institutional Review Board of Severance Hospital, Yonsei University College of Medicine (4–2016-0408). We grouped the variables collected for study into four categories: baseline characteristics, chemotherapy-related information, variables before operation, and surgical outcomes including pathologic results. The baseline characteristics included age, gender, clinical T and N stage, type of distant metastasis, neutrophil / lymphocyte ratio (NLR, %), systemic immune-inflammation index (SII, platelet count × neutrophil count / lymphocyte count), and albumin level (g/dL) at initial diagnosis. The chemotherapy-related information included the regimen of palliative chemotherapy; the best response and preoperative response (response at the time before operation) to palliative chemotherapy overall, at the local region, and at the metastatic sites; number of cycles of chemotherapy. The response to chemotherapy was defined according to RECIST criteria version 1.1 and categorized as complete response (CR), partial response (PR), stable disease (SD), or progressive disease (PD) . The variables before operation included the change in body mass index (BMI), the change in tumor markers, the clinical T and N stage immediately prior to surgery, and during the time interval between the initial diagnosis and surgery. Clinical T and N stage was evaluated by one radiologist with CT images according to AJCC 7th guideline. We assumed stomach lesion with definite extramural fat infiltration or adjacent organ invasion as clinical T4 lesion. The patients were classified into three categories based on BMI (kg/m2) in the period between diagnosis and surgery: underweight (BMI < 17.5), overweight (BMI ≥ 23.0), and normal (17.5 ≤ BMI < 23.0). The changes in the carcinoembryonic antigen (CEA) and carbohydrate antigen (CA 19–9) tumor markers between the initial diagnosis and surgery were classified as stable (no change), improved (high levels decreased to the normal range), worse (normal levels increased to the high range), and not available (with any missing value). The surgical outcomes included the presence of peritoneal infiltration, whether or not metastasectomy was performed, the extent of gastrectomy and lymph node (LN) dissection, and curative resection. In this study, curative resection means complete macroscopic resection (CMR) which was defined there was no visible tumor in abdomen after surgery. We also considered variables of the pathologic T and N stage, the Lauren classification of the surgical specimen, and presence of postoperative chemotherapy as potential prognostic factors. We analyzed categorical variables based on the proportions among the patients and continuous variables based on the mean and standard deviation. The primary outcome was OS, defined as the time from the diagnosis of gastric cancer to the time of death by any cause. We generated survival curves by the Kaplan-Meier method and compared them by log-rank tests. We used a Cox proportional hazard regression model to identify risk factors for OS. We described the risk factors by a hazard ratio (HR) with 95% confidence interval (CI). We conducted a multivariable Cox analysis with the variables that had p-value ≤0.10 in the univariable analyses. We selected the final model by the forward likelihood ratio method. Two-tailed p-value ≤0.05 was considered statistically significant. All analyses were conducted using SPSS (version 19.0 software, IBM SPSS, Chicago, IL). The median age of the enrolled patients was 52 years (Table 1). The study population was 59.4% male. At the time of diagnosis, 80.2% of the patients were suspected to have clinically serosa-positive depth of invasion, and 84.2% of the patients were suspected to be beyond the clinical N1 stage. The reasons for diagnosis of stage IV disease varied, including peritoneal carcinomatosis (32.7%), liver metastasis (10.9%), distant LN metastasis (34.7%), Krukenberg tumor (20.0%), and two or more distant metastases (19.8%). The mean baseline values of NLR, SII, and albumin were 2.67, 9.14, and 3.94, respectively. The preoperative chemotherapy regimen was platinum plus fluoropyrimidine in 50.5% of the patients, taxane plus fluoropyrimidine in 11.9% of the patients, platinum plus taxane plus fluoropyrimidine in 14.9% of the patients, taxane plus platinum in 15.8% of the patients, and others in 6.9% of the patients. Overall, 64.4 and 59.4% of the patients had CR or PR to preoperative chemotherapy as best response and preoperative response to the chemotherapy, respectively. When the responses were divided into the local region and the metastatic sites, the rate of CR/PR was lower in the local region (46.5 and 42.6%) than in the metastatic sites (83.2 and 77.2%) in both best response and preoperative response. CR of metastatic site was observed in 72 (71.3%) and 66 (65.3%) patients in best and preoperative response, respectively. The median number of cycles of chemotherapy was 6 (1–32 cycles). Nine patients (8.9%) were considered underweight during chemotherapy treatment, and 52.5% of the patients were considered overweight. The levels of CEA and CA19–9 improved in 16 and 10 patients, respectively, and worsened in 3 and 5 patients, respectively. After the initial chemotherapy, both the T and the N staging was downgraded in overall; the proportion of serosa-negative was 47.5% and that of N0/N1 was 32.7%. The interval from chemotherapy to surgery was ≤24 weeks in 51 patients. During the surgery, 32 patients displayed peritoneal infiltration. Metastasectomy was conducted for 11 patients (three hepatectomy, six para-aortic LN dissection, and three oophorectomy). Fifty-seven patients underwent total gastrectomy, and 76 patients underwent ≥ D2 LN dissection. Finally, CMR was achieved in 57 patients (56.4%), and 46 and 42 patients were found to have intestinal and diffuse-type gastric cancer, respectively. In the final pathologic diagnosis, 54 (53.5%) of the patients were serosa positive (pT4a/b), and 66 of the patients (65.3%) had ≥3 metastatic LNs. Eighty-four patients were treated with postoperative chemotherapy. There was no postoperative surgery-related mortality for 1 month. The detailed information is summarized in Table 1. The median follow-up duration was 63.3 months. Seventy-three patients (72.3%) died during follow up. The median OS of the patients was 26.0 (95% CI, 21.6–30.3) months. Figure 1a depicts the different prognoses by the type of distant metastasis. Compared with the prognoses for patients with other types of distant metastasis, the prognosis for patients with liver metastasis (median survival, 49.2 months) was better, and that for patients with Krukenberg tumor (median survival, 13.6 months) was worse. In the univariate Cox analyses, greater age was related to better OS (p = 0.047), whereas other baseline characteristics such as gender, initial clinical T and N stage, and initial NLR, SII, and albumin levels were not statistically significant (Table 2). There was no difference in prognosis based on the regimen of preoperative chemotherapy (Fig. 1b and Table 2). The overall response to chemotherapy was not statistically significant to the prognosis in both best and preoperative response (log-rank p = 0.199, 0.634, respectively, Fig. 2a and d). 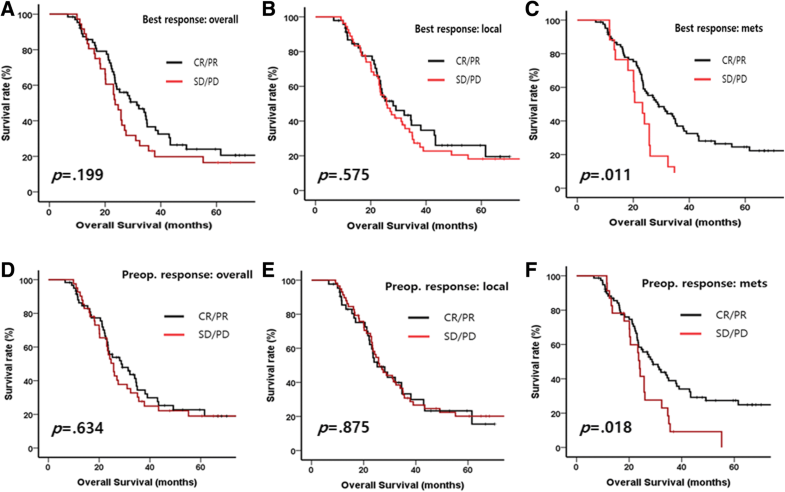 The response of local region to chemotherapy showed similar prognosis in both best and preoperative response (log-rank p = 0.575, 0.875, respectively, Fig. 2b and e). However, CR/PR at the metastatic sites was significantly related to OS in both best and preoperative response (log-rank p = 0.011 and 0.018, respectively, Fig. 2c and f) and univariate HRs were also statistically significant (HR for best response: 2.105 [1.171–3.783], p = 0.013, HR for preoperative response: 1.850 [1.103–3.103], p = 0.020, Table 2). Among the preoperative variables, BMI and changed CEA level was related to prognosis (Fig. 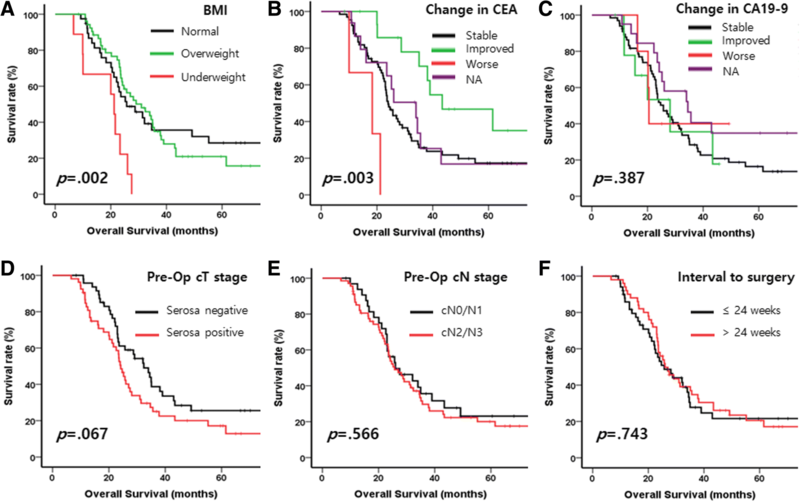 3a and b, and Table 2): patients experienced underweight were related to poor prognosis (p = 0.002) and patients with improved CEA level were related good prognosis (p = 0.003). Other variables such as changed CA19–9 level, preoperative clinical T and N stage, and interval to surgery were not related to the prognosis (Fig. 3c-f and Table 2). Figure 4 and Table 2 showed the prognosis of each variable of surgical outcomes. The presence of peritoneal infiltration (p = 0.001, Fig. 4a), extent of gastrectomy (p = 0.007, Fig. 4b), CMR (p < 0.001, Fig. 4d), pathologic T stage (p = 0.002, Fig. 4f), Lauren classification (p = 0.001, Fig. 4e) were related to the prognosis, and univariable Cox analysis showed similar results (Table 2). Other factors such as metastasectomy, extent of LN dissection, pathologic N stage, and postoperative chemotherapy were not related to OS (Fig. 4c, g, h and Table 2). The multivariable analysis was conducted with the variables that had p-value < 0.1 in the univariate analyses (age, type of distant metastasis, best response of the metastatic sites, BMI, change in CEA level, preoperative cT stage, presence of peritoneal infiltration, extent of gastrectomy, CMR, pT stage, and Lauren classification). The best response of the metastatic sites [HR: 1.822 (0.999–3.323), p = 0.050], change in CEA level [HR of improved, worse, and NA compared with stable: 0.564 (0.259–1.226), p = 0.148; 5.013 (1.477–17.017), p = 0.010; 0.973 (0.504–1.877), p = 0.935; respectively; overall p = 0.024], and CMR [HR: 1.998 (1.233–3.238), p = 0.005] were selected as factors that related to the prognosis of the patients (Table 3). Subgroup analyses according to the type of distant metastasis were conducted to evaluate the effects of the variables that were selected for the final model (best response of metastatic sites, change in CEA level, and CMR). 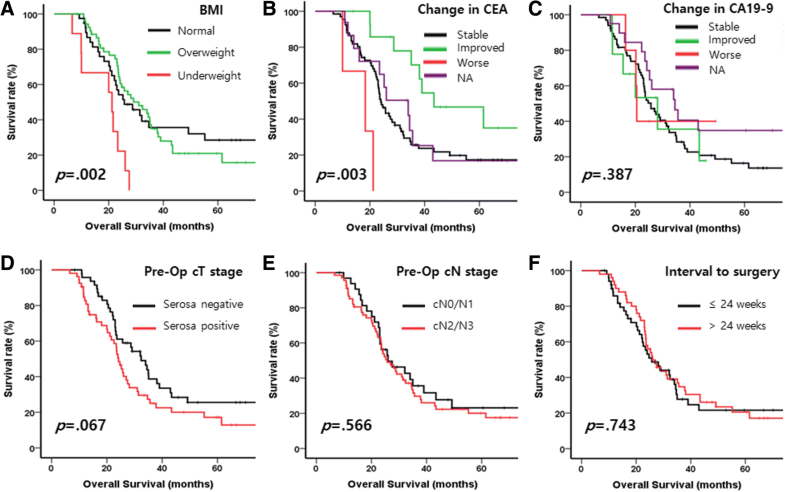 In the patients with peritoneal carcinomatosis, there was no trend for the best response of metastatic sites or change in CEA level (Additional file 2: Figure S2A and B), and CMR was marginally related to better survival but was not statistically significant (log-rank p = 0.064, Additional file 2: Figure S2C). There were no remarkable trends among the patients with liver metastasis (Additional file 3: Figure S3A-C) and distant LN metastasis (Additional file 4: Figure S4A-C), respectively. Among the patients with two or more distant metastases, the best response of the metastatic sites was related to OS (log-rank p = 0.007, Additional file 5: Figure S5A), and there were trends for better prognosis with improved CEA level and CMR, respectively, although those trends were not statistically significant (Additional file 5: Figure S5B and C). Patients with stage IV gastric cancer usually have a poor prognosis and are primarily considered for systemic chemotherapy, but not for surgery. The exception to that is patients who require rapid palliation of cancer-related complications such as bleeding or obstruction . Recent advances in gastric-cancer chemotherapy, including the introduction of new anticancer agents and the development of multi-agent regimens, have made complete macroscopic resection possible in some patients with stage IV gastric cancer. That strategy of treatment is referred to as conversion gastrectomy with curative intent and is distinct from palliative gastrectomy. The results of previous studies of surgical resection after preoperative chemotherapy for initially metastatic gastric cancer are summarized in Table 4 [12–24]. Although the chemotherapy regimens and definitions of gastrectomy varied across the studies, the reported OS ranged 19 to 53 months, which revealed much better outcomes, considering the generally poor prognosis for stage IV gastric cancer. The limitations of the previous studies include small study samples and the use of retrospective methods of analysis. Some of the studies investigated prognostic factors for gastrectomy and presented various factors including R0 resection as significant prognostic factors. In our study, the median OS of the patients was 26.0 months. Survival outcomes did not differ significantly according to clinical factors at diagnosis including metastatic sites and chemotherapy regimens. In addition to CMR, CEA change as well as the response of metastatic sites to chemotherapy were significant prognostic factors in the multivariable analysis. Successful curative surgical resection is the most frequently presented prognostic factor of conversion gastrectomy so far. Yabusaki et al. reported that patients obtaining CR/PR to chemotherapy as well as those with R0 resection and D2/D3 LN dissection had longer survival . Fukuchi et al. 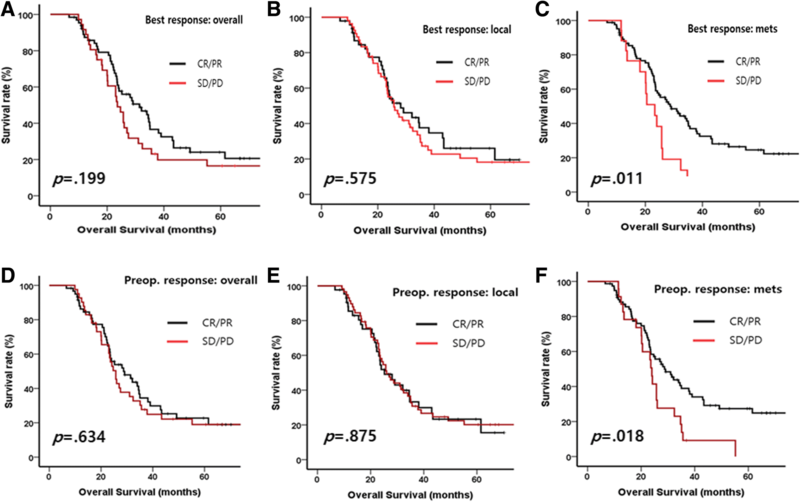 also demonstrated that R0 resection as well as one non-curative factor was an independent significant predictor for overall survival in patients who underwent conversion surgery . In general, R0 resection which means that no cancerous cell is seen microscopically in surgical specimen corresponds to resection for cure or complete remission. However, definitive R0 resection is rarely achieved because many cases with stage IV gastric cancer have non-measurable lesions including peritoneal diseases. For example, peritonectomy or pathologic confirmation of residual cancer in surgery for this case is not common surgical procedure in operative field. Our data showed that only 11(10.9%) of 101 patients underwent metastasectomy with gastrectomy. Thus we defined that curative resection means complete macroscopic resection in abdomen after surgery. Definition of the concept of “conversion therapy” and the patients who are eligible for such a procedure remain to be clarified. In this study, the response to chemotherapy was important to the prognosis following surgery. Our data showed that the response of the metastatic sites, rather than the overall response, to chemotherapy was a significant prognostic factor. The reason could be related to the original nature of the RECIST evaluation system. We analyzed the chemotherapy response by dividing the response into that of the local region and that of the metastatic sites, adding those responses to the overall tumor response. The local tumor, including the primary stomach cancer and the regional LNs, is mostly evaluated as a non-measurable lesion, and its response is categorized as CR, non-CR/non-PD, or PD. CR of the primary stomach cancer is seldom observed. For example, although metastatic sites without measurable lesion reveal CR, the overall response is not CR or PR but is instead non-CR/non-PD in cases in which the local tumor without measurable lesion showed a non-CR/non-PD response. Our results suggest that the chemotherapy response of the metastatic sites is more important than the overall response for the selection of patients who would benefit from conversion gastrectomy. Our results demonstrate that, in addition to the tumor response assessed grossly, the biochemical tumor response is another significant prognostic factor for OS. Patients with an improved CEA level might obtain a survival benefit from curative surgery subsequent to chemotherapy. In terms of the optimal timing of the surgery, we investigated whether the time interval between chemotherapy and surgery could influence the overall outcome, but the timing was not significant in a univariate analysis. Recently, the REGATTA trial demonstrated that chemotherapy following palliative surgery for stage IV gastric cancer is not beneficial to survival outcomes based on an interim analysis and the trial was early closed . Surgical resection following chemotherapy has since drawn attention from clinicians who treat patients with gastric cancer to enhance survival. It remains unclear whether conversion gastrectomy improves the prognosis in initially stage IV gastric cancer. The results of our large-scale study combined with those of previous studies demonstrate that conversion surgery after preoperative chemotherapy greatly extended survival for patients with stage IV gastric cancer. Patients who received CMR, showed CR/PR of metastatic sites to chemotherapy, and had an improved CEA level during preoperative treatment could have considerably better prognosis than those without those factors, suggesting that those factors might be useful selection criteria for conversion surgery. Further investigation is required, however, to determine how to maximize the chemotherapy response. Our study has some limitations. First, we used a retrospective design to study patients at a single institute. Because of the retrospective design, the preoperative chemotherapy regimen and the timing of the operation varied somewhat. Second, the patients included in our study did not represent the whole population of patients with stage IV gastric cancer. Many of the patients who received surgery were likely to have potentially resectable disease at the time of diagnosis, and there might have been a selection bias for patients who respond well to chemotherapy. In addition, only small percent of patients could be received surgery among overall patients with stage IV gastric cancer in that period, therefore, the interpretation of benefit from conversion surgery in the present result should be cautious. Third, there might be a discrepancy between the clinical stage and the true disease dissemination, because metastasis was not pathologically confirmed in most of the patients. Lastly, type II error have to be considered for some subgroup analysis because of small size of cohort in this study. We evaluated the outcomes of surgery for stage IV gastric cancer in the largest patient group to date and demonstrated that treatment with chemotherapy followed by gastrectomy is feasible and improved long-term survival. Better response (CR/PR) of metastatic sites to chemotherapy, change of CEA level, and CMR were significant prognostic factors. In conclusion, although stage IV gastric cancer still has a poor prognosis, our results suggest a practical, multidisciplinary treatment plan for select patients. Large-scale, prospective, multicenter, randomized trials are needed to further determine the best treatment strategy and to elucidate the prognostic role of conversion gastrectomy. Numerous obstacles are yet to be resolved regarding the selection of appropriate patients for conversion gastrectomy, the choice of preoperative/postoperative chemotherapy regimen for obtaining a maximal response, and the optimal timing of conversion surgery. Seung-Hoon Beom and Yoon Young Choi contributed equally to this work. This research was supported by a faculty research grant from the Yonsei University College of Medicine (6-2007-0095, 6-2008-0193, 6-2016-0115) and the National R&D program for cancer control, Ministry of Health and Welfare, Republic of Korea (1520190). The datasets are available from the corresponding authors on reasonable request. SHB and YYC collected data, carried out statistical analysis, and drafted the manuscript. SEB, SXL, JSL collected the data and revised the manuscript. TS, HIK, JHC, WJH, SHC, MJ, HSK, HCJ, HCC revised the manuscript and gave the information about surgery and chemotherapy based on their expertise. SYR and SHN participated in the design of the study, analyze the data, and revised the manuscript. All authors read and approved the manuscript. This study was approved by the Institutional Review Board of Severance Hospital, Yonsei University College of Medicine (4–2016-0408). The need for consent to participate has been was waived by the Institutional Review Board because of retrospective design of this study.